Look past all of the unrest and natural disasters. I see a need and wonderful opportunity for all of us to reach out and connect more personally. When I turn off the television, put my phone down and calm my mind, I come back to what every single person on earth has in common…food. Every living person eats. From those in a remote African village, to those in a London café. A farming family in Bali, and a farming family in Iowa. We gather together and break bread with those we love. Preparing and serving food is an act of love. A mother feeding her baby, a father standing vigil over a hot barbecue grill loaded with ribs rubbed down with his secret blend of spices, a grandma at the stove with her steaming pot of traditional Italian spaghetti and meatballs laced with parmesan cheese and basil. We all look for spices and seasonings, no matter how basic, to enhance nature’s bounty. To add our personal pinch of a special blend of herbs to make it our own and show our love. I pledge to move forward and savor these delicious moments of life and remember that it’s best around the table with those I love, sharing stories, tears, smiles and making memories. Join me! Some of my favorite food memories include sitting in the backyard with my family on a Summers eve while lightning bugs starting to appear in the dusk, eating a wedge of fresh watermelon from a local farmer, sprinkled with salt. My mom canning pickled beets and onions, the peppercorns and bay leaves pressed against the side of the jars sitting on the countertop atop a dish towel, gleaming with heat. Eating mussels and French fries generously topped with parsley in a basement café on a chilly Paris evening with my husband, the Eifel Tower looming just across town. Trying small hard-boiled quail eggs at the market center in Peru- you get a small baggie full of them, and a toothpick to eat them with. Enjoying “mofongo” in Puerto Rico for the first time with great friends and loving it (a dish with mashed plantains, tasting similar to smashed potatoes). What are your favorite food memories? I love to travel (my dad jokes that I have gypsy blood), and trying new foods and making new friends along the way. It helps me to understand their culture, their families and helps to make the world a smaller place. I am grateful for the efforts taken for the meals placed in front of me. Gratitude seems a fitting place to begin. 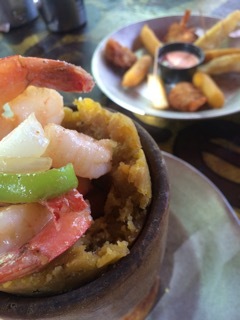 I feel that if I can start a conversation with a Puerto Rican about mofongo, then we have a bridge, a place to start. We both can envision it in our heads, we can almost taste it through our conversation, and thus we have started a link, a bond, found a common place through food. A place of understanding, which helps to find peace. Peace through food. NEWSLETTER 4/16/19: Last Minute Easter Treats!